Purflings are the decorative inlays highlighting the edges on the faces and backs of most stringed instruments. 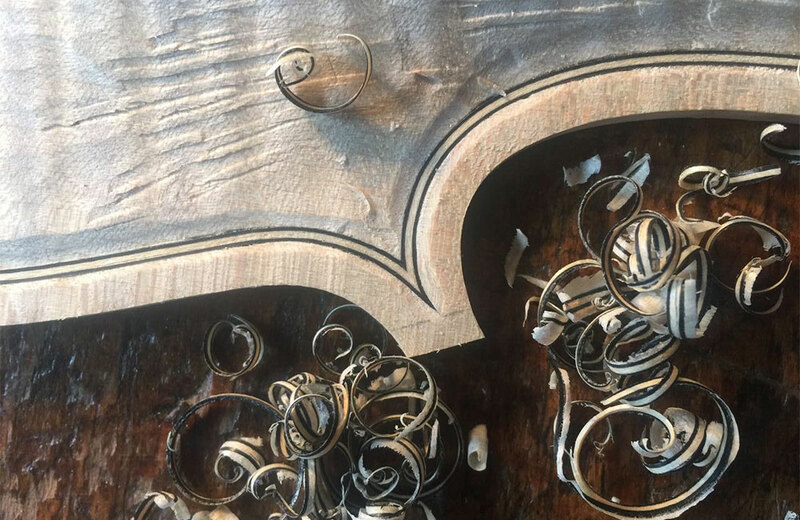 Since the first violins were made in the 16th Century, purflings have been consistently a key component of the aesthetic of violins, violas and cellos. A tiny sandwiching of three woods of contrasting colors is set in a carved channel that travels along the edge of the entire front and backside of the instrument. Aside from adorning the instrument, purflings may add flexibility to the top plate while reinforcing the plate’s edge against cracks running with the wood grain. First, materials must be selected to create the purflings. 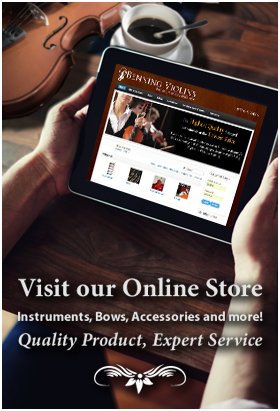 These vary widely among violinmakers. The two outer strips tend to be made darker, while the inner strip is of lighter color. Some use ebony for the dark strips, though it is a hard and unbending wood. Others may use maple for all three, while coloring the outer strips in a dying process using Lockwood and ferrous sulphate. A few makers have turned to non-wood materials, such as whale baleen or corn husks, to create the dark sandwiching layers. Fancier purflings might come from nacreous shell or silver. The layers can be “shaven” and then stacked and glued. Then, going crossways, they are shaven again. The three wood strips are about 1.5mm. to 3 mm. wide and bendable. A blade is used to score the edges of the purfling channel, and then a knife is used to deepen the edges. Then, with a narrow-bladed chisel, the luthier removes the wood between the cuts. A bending iron can be used to heat and bend the purflings to the correct shape. They are then placed into the channel. Small adjustments can be made to the channel to ensure a comfortable fit. The “mitre” is the name for the pointed edges of violins, violas and cellos where two layers of purflings connect, also called the “bee sting.” The mitre is particularly difficult and requires great skill. The two sets of layers are cut to fit together so that the colors align. Finally, hot animal glue is applied to set the purflings in place. A light hammer can be used to tap gently on the purflings to even them and squeeze out any excess glue.